Asturcón, also known as Asturian, Horses are a pony from the Asturias region of northern Spain. 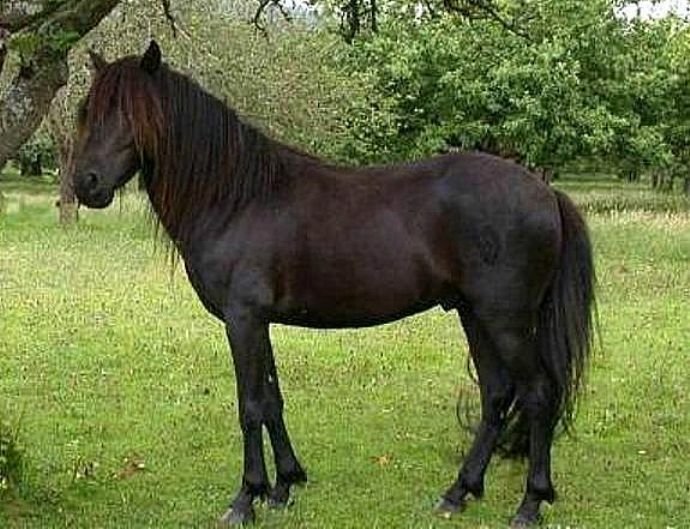 They are an ancient breed and their ancestry is not known, although most likely they are a cross between Sorraia, Garrano, and ancient Celtic ponies. They are usually brown or black, with minimal white markings. They stand between 11.2 and 12.2 hands (46 and 50 inches, 117 and 127 cm). Asturcón ponies have a naturally ambling gait that is comfortable for the rider. As a result, a large portion of their population was taken to Ireland to produce the Irish Hobby. These ponies are hardy and resourceful, and able to survive in the harshest areas. They are obedient and easily domesticated, and are used for riding, driving, and as pack horses. They tend to have a small but heavy head, a thin neck with a large mane, low withers, a deep chest, straight shoulders, and strong legs. They are rounded through the barrel, and have a sloping croup with a low-set tail. They historically have faced near extinction, but recently activist groups have been formed to protect the pony.